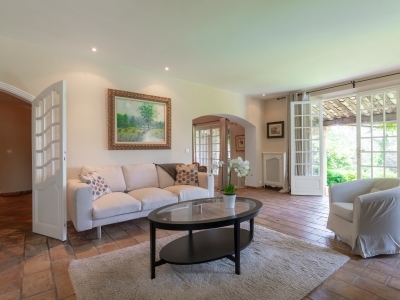 Beautiful dream home in a peaceful domain 5 min from Mougins Village. 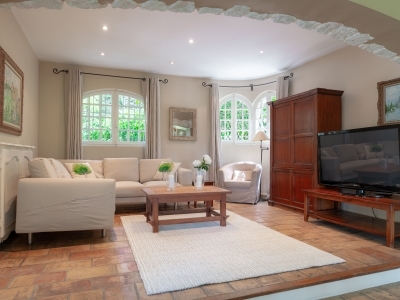 This wonderful house - a little corner of paradise - is situated in an exclusive domain in one of Mougins most beautiful parks. Very tastefully decorated and thoughtfully laid out with large, pleasant bedrooms, many bathrooms, generous social areas and above all a well-kept garden with a large, heated pool and fine terraces. Here you can enjoy relaxed peaceful days in total privacy and sun all day long with your family and friends. 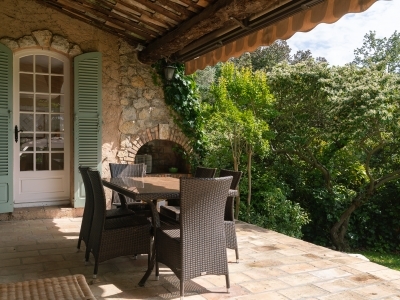 Close to shops and a bakery, and just a few minutes by car to Mougins village with galleries and cozy restaurants and 10 minutes to Cannes with beaches, exclusive shopping and a multitude of restaurants and cafés. A dream accommodation for 1-2 families who wants maximum comfort and enjoy a beautiful home close to everything that the Riviera has to offer! Sleeping capacity: 8 beds and 2 possible extra beds. 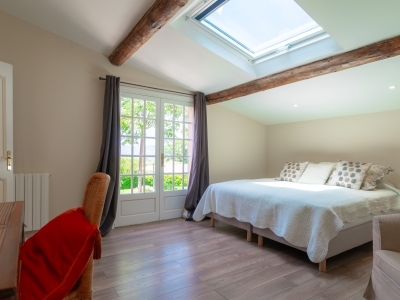 Rooms: Warm and inviting entrance with hall and guest toilet, big beautiful living room with big fireplace, separate TV-corner, big terrace doors leading out to the outdoor eating area and the garden. 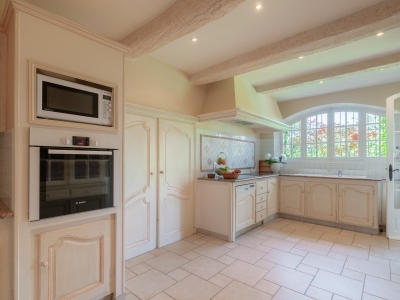 Part of the living room is also a nice dining area with a door that leads to a big comfortable kitchen. On this entrance level you also have 3 big bedrooms with double beds and comfortable bathrooms en suite. Staircase up to second floor with bright bedroom with smaller dubblebed, separate office and an extra room for children with possibility to put in extra beds. The terrace continues to a large sun deck next to the pool. On the same level, the huge grassed garden is spread before you. House size: Approx: 250 square meters. 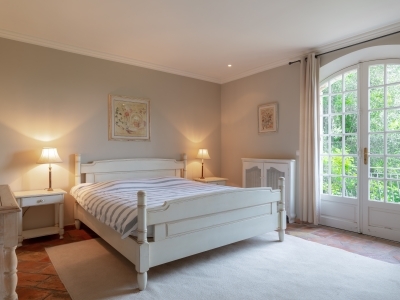 Standard/style: Very tastefully decorated in classic, provencal style. View: Nice garden view and partly sea view and lovely mountain view from the second floor. s Big nice garden with lovely trees and shrubs. Shade here and there, much appreciated during the scorching summer. Large, heated pool with nice sundeck. Parking for 3 cars. Facilities: Well equipped kitchen with dishwasher, microwave, 2 fridges and freezers etc. Washing machine, dryer, TV with international channels, stereo, CD-player, wireless internet, BBQ. 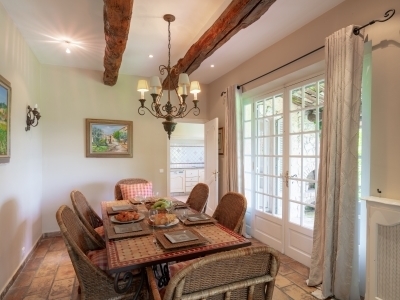 Location: Close to the classical village of Mougins and next to Mougins biggest park. 10 minutes to Cannes and the whole coastline of beaches. Peaceful location in a beautiful and sought-after villa area. Near to food shops, bakeries, etc. Bathing: 5-10 minutes to the beaches in the area of Cannes, Mandeliue, Golfe Juan and Antibes. Golf: 3 minutes to Mougins golfcourse (one of the best) and 10 min drive to some of the Riviera’s most attractive golf courses. Available july - august. Arrival Saturdays 16:00, departure Saturdays 10:00. Smoking indoors is not allowed. For other rental and booking conditions refer to Booking.